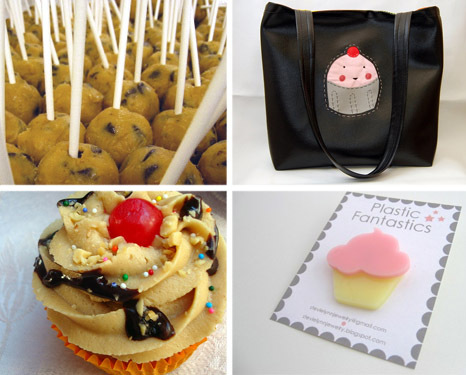 From top left, clockwise: cookie dough pops by Handmade Cookie Co.; CakeSpy/Penguinbot tote; Bake and Destroy cupcake; button by Stevie Lynn jewelry. Cookie dough pops: the most beautiful three words ever? In Miami, there's a new (vegan) cupcake in town: Bunnie Cakes makes custom order vegan and gluten-free cupcakes to order in a great variety of flavors. Oh. My. God. Penguinbot and CakeSpy collaborate, resulting in the sweetest tote and wrist bags ever! You can buy them at the newly revamped cakespyshop.com! Special Delivery: San Francisco's Bike Basket Pies delivers their freshly baked wares via bicycle! Bake & Destroy's Elvis Cupcakes: I've tasted them. Jealous? You should be. But don't be too sad, because there is a recipe. Plastic fantastics: do you love these hand-cut acrylic cupcake buttons by Stevie Lynn Jewelry as much as I do? Sweet Potato Spice Cake Doughnuts. Need I say more? In Detroit, retro desserts reign, according to the Detroit News. Oatmeal S'more Cookies? Yes, yes, yes. Cheesecakes, delivered to your door. Pink Cake Box is making cakes for a cause--if you're in the NJ area, enter their raffle to win one! Amy Atlas outdoes herself with this gorgeous faux bois dessert table. Have you seen CakeSpy buddy Bakerella's new site design? It's gorgeous!